Remove a layer of white backing paper under the rhinestone patterns need to be ironing, and place the transfer film paper sticking to the rhineston pattern on the clothes as you think fit. Switch the electric iron to “cotton” settings (about 150 degrees). Steam iron do not turn on steam or water, dry iron is good. Place clothes on a flat surface, sometimes with a towel or two on the surface for ironing stronger. Press the iron on the hotfix rhinestone patterns hard for about 12 seconds. If the hot fixt pattern is too large, the iron can not be covered at one time, move the iron on the pattern repeatedly, making the entire hotfix rhinestone patterns evenly heated and the ironing time is also extended accordingly. 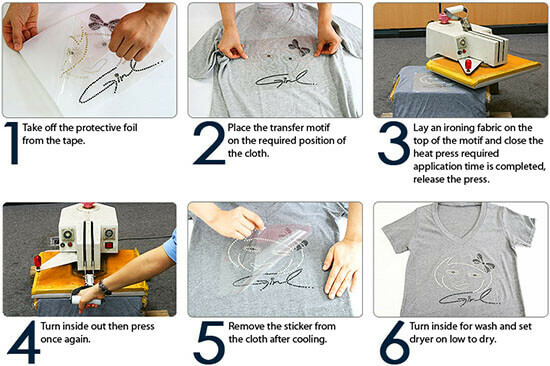 After ironing, remove the adhesive paper on the surface after the ironing drawing is cooled. A beautiful rhinestone transfer patterns is completed. Check to see if each rhinestone is already attached. If not, use a lighter to bake glue. Note: since most electric irons carry steam, small holes affect the heat under the iron, so move the iron back and forth during ironing to equalize the heat. The hot drawing will be firm.